Everything in life isn’t always perfect – of course it isn’t. I’ve realised it’s in these challenging moments that we really demonstrate what we are made of both to ourselves and to the outside world. When I left Innsbruck, in heavy rain, I should have known… as I climbed high into the Austrian Alps that the rain was going to turn first to sleet and then to snow. But, honestly, it didn’t occur to me, I just drove on. Oblivious. In fact I was congratulating myself on the easy drive ahead, less than 200 miles and a scenic route over the Alps from Austria into Italy. 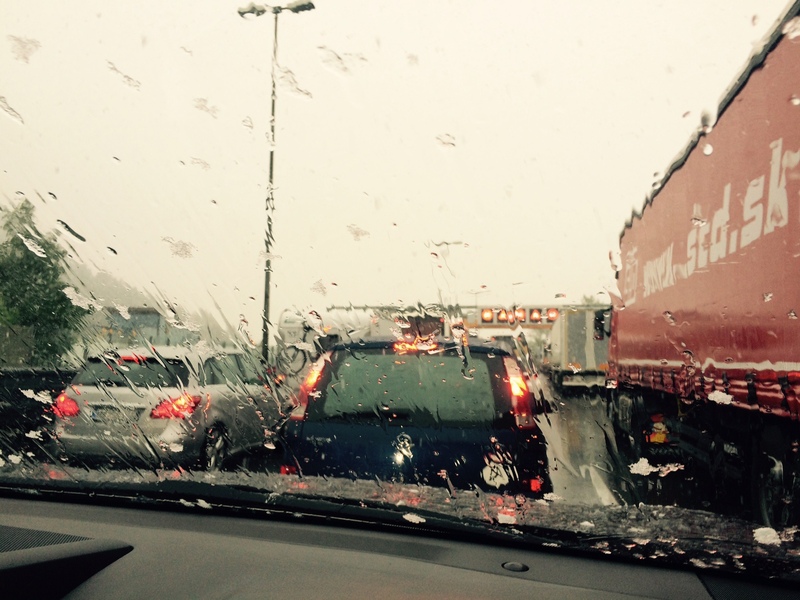 I joined the motorway at Innsbruck and noticed immediately large numbers of lorries filling two lanes and moving very slowly. The third lane was moving a little faster, just cars, as the rain poured down, heavier and heavier. The rain turned first to sleet and then to snow. In moments the motorway came to a grinding halt. I sat there in my car patiently. After about half an hour I began to wonder about alternative routes, I checked my GPS. I realised that there was an intersection coming up so I manoeuvred through the lorries, came off the motorway and joined the old main road heading high over the mountains and into Italy. Clever me, I thought to myself as I drove through several small villages and headed up into the Alps and towards the Brenner Pass. The Brenner Pass (Brennero in Italian) is one of the lowest of the Alpine Passes at 1350 m above sea level. It is also the busiest road transport route in Europe. It links Northern and Southern Europe and thousands of goods vehicles cross the pass daily. As I headed out of town and into the countryside I came to a T junction. A police car was coming down the hill towards me, it pulled across the road and indicated for me to stop in front of it. How nice I thought, they are going to tell me about the weather conditions up ahead. How very considerate. Wrong, I’m totally wrong, they’ve stopped me because I have my side lights on and I should have my headlights on, because of the snow. The humourless and monosyllabic policeman gave me an on the spot €25— fine. He laboriously filled in various forms, whilst he sat in the car and I stood in the snow. He had no charm and certainly no empathy. His command of English extended to ‘You pay € 25—now’. I paid. I carried on up the hill, in the snow, heading for the Brenner Pass and the border with Italy. It was only 10 miles from the pass and the border, I felt like I was nearly there. It was snowing heavily now and I noticed the flakes accumulating at the side of the road and on the grassy hillsides. I was driving into what the brochures call ‘a winter wonderland’ even though it was mid-May. Still I continued confident and undeterred. After all I was driving a four wheel drive Toyota – that car can handle anything. I noticed from the GPS I was just 3 miles from the highest point (the pass). I started to plan my lunch in Italy, just a short drive away. Oh should I have spaghetti or maybe tortellini. I glanced up to my right where I could see the motorway filled with un-moving traffic. Again I felt a wave of satisfaction flooding over me as I congratulated myself (yet again) on my decisive and intelligent actions. As I rounded the next corner the traffic came to a sudden halt. The road snaked around the hillside ahead of me – it was filled with cars, lorries and vans. The snow continued to fall. By now there was at least eight inches of snow on the ground. As the traffic moved forward slowly I saw that the ordinary family cars were struggling to get a grip in the snow. BMW and Mercedes were doing the worst – skidding sideways. Ahead of me a coach filled with passengers was sliding at 45 degrees to the road. The traffic ground to a halt yet again. I waited patiently in the car yet again. After about 45 minutes I realised I needed to find a private spot to go to the loo. There was nowhere suitable to be seen. I hopped out of the car and started walking up the hill. Fortunately I had my ski anorak with me and I was wearing trainers. As I walked past the queue of cars many drivers opened their windows and asked me what was happening and why there was a huge traffic jam. I explained in a mixture of English, French, Italian and pigeon German that I really didn’t know – although I assumed it was the weather. The irony of my situation made me smile. 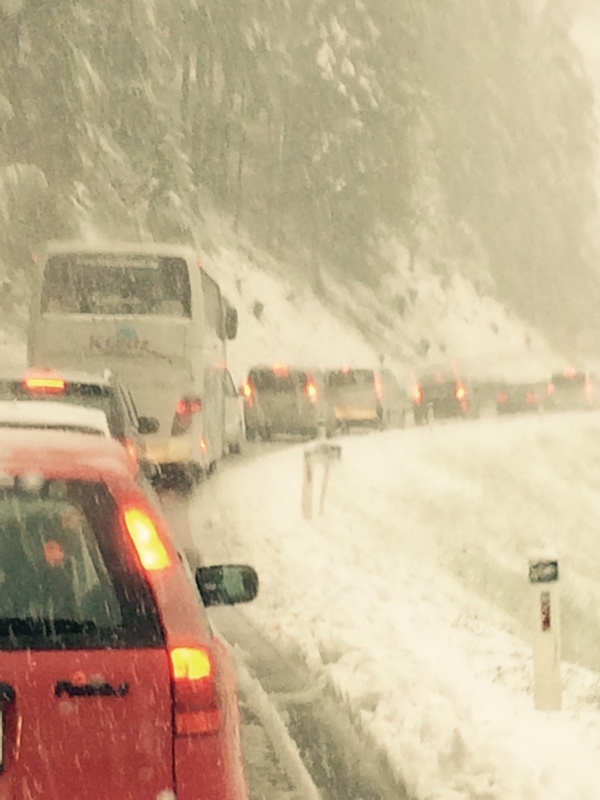 Here I was stuck on a mountainside in Austria, in a massive traffic jam and desperate for a pee (typical). I’m not Austrian. I’m not local and people are asking me my opinion and what I know about the predicament we find ourselves in! I followed the road as it rounded the shoulder of the hill, I probably walked for about 3/4 mile and finally saw some farm buildings to my right. Great I thought to myself I’ll nip behind the barn, which I did. When I emerged from the shadows of the barn nothing had changed. The snow continued to fall, the cars still weren’t moving. The coach driver was trying (somewhat belatedly) to fit snow chains. The road up to the pass was snowy and blocked. The day was lumbering on and the weather was not improving. A decision had to be made. Sasha, my little dog was asleep in the back of the car. She hates getting her paws wet! There was a parking area ahead of me, blanketed in snow. I decided to drive up to the parking area and turn round. My car is a 4 wheel drive I can easily do that I thought to myself. So I drove hesitantly forwards pulled into the lay-by and executed a reasonable 3-point turn. I started to drive slowly back down the hill. There was so much snow and conditions were so slippery that I had to drive down the hill in first gear and later second gear. It was only safe to proceed at a snail’s pace. By the time I had covered about two miles down the hillside a snow plough appeared and started to clear the snow. I smiled at the irony of its arrival – it was too late for me! I retraced my steps back into the valley. At 2pm I was just outside Innsbruck and at the point where I’d started from more than six hours earlier. Now I had a dilemma, I needed to be in Italy at Venice Airport at 11 am the next morning and I was still on the wrong side of the Alps. I had a think, well if I drive east towards Salzburg then maybe the weather will get better and I can cross the Alps in the north-east corner of Italy close to the border with Slovenia. I headed east along the motorway. The opposite carriageway was a sea of lorries, parked up, thousands and thousands of them. They stretched for miles, like a giant convoy awaiting instructions from a higher power. The weather did improve gradually, the rain began to subside. Somewhere outside Salzburg I stopped and gave Sasha a little walk and ate some crappy service station food. Then it was back on the road, heading back into the mountains and once again the border with Italy. My destination that evening was a small Austrian border town. I can’t name it because it is a long time since I’ve stayed in such a grotty run-down place with nothing to recommend it. I found a small guest house by the river with parking (always an advantage) so I walked into the dimly lit hall to see if they had a room available. Accidentally I opened the door into a private room where a group of people were sat round a table playing cards. I don’t know what the stakes were but it looked pretty serious. I retreated rapidly and found the ‘guest dining room’. A helpful young girl told me that a room was € 38—per night. Well you can’t argue with that I thought. After a pretty good night’s sleep I was up early to cross the border into Italy. It’s a long time since I’ve been so glad to get back to my beloved ‘Italia’. I stopped at one of the first service areas for a typical Italian breakfast of really good Italian coffee and a fabulous sugary bun – hurray I was back in my adopted homeland. Sasha was delighted with the poppy strewn field next to the bar where she could run about and encounter many interesting and unusual scents. Then it was back in the car and on to Venice to meet my friend Sue. Despite the drama of my journey I was only ten minutes late. Now that’s impressive. Ha, ha – I’m allowed on the bed! Sasha says I like it here! Be patient and accepting of what lies ahead. There is humour in almost every situation. All experiences are valuable even if they may not appear to be positive at first. Never under-estimate the importance of a good cup of coffee!